Now that the United States is officially getting back into space exploration, the Moon now seems to be the focus - or at least the starting point - of a lot of plans involving space travel. The Trump administration has redirected NASA's priorities to settling on our lunar neighbor before Mars. SpaceX CEO Elon Musk has said the BFR project will be a key factor in creating a lunar base. To continue the trend, Bigelow Aerospace and the United Launch Alliance (ULA) announced last week they would be collaborating to design an inflatable habitat. 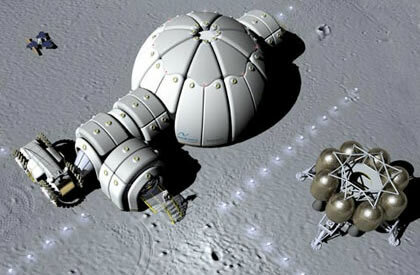 The habitat would be launched into space by the end of 2022, and eventually function as a lunar depot. Once it's fully up and running good, additional launches will be carried out to provide 35 tons of cryogenic propellant to the module. It will then be maneuvered into its final location: the low lunar orbit. The United States isn't the only country that has plans for the Moon though. Russia and China are set to sign a multi-year space exploration deal that covers lunar and deep space exploration, and Russia is working with NASA on the Deep Space Gateway project to build a lunar space station.